Not too tricky to locate, as long as you get onto the right footpath! Take either road (both steep narrow and very bendy in places!) up from Logie on one side or Bridge of Allan on the other, towards Sheriffmuir and head to the Faerie or Highlandman’s Well. About 150 yards before this, note the small car-park. From here, go through the gate as if you’re walking to Dumyat, but 50 yards along the footpath it splits into two. Take the lower right-hand path and keep walking for another 600 yards until you see a large worn hawthorn tree on your left, with boggy land just in front of it that runs to the path you’re walking on. That’s it! ‘Katie Thirsty’ is a most intriguing character who pops up at a number of healing wells, primarily in Scotland. Dedications to her are known near Abernethy, Falkirk, Innerleithen, Killearn, Kilsyth and elsewhere, with one example just over the Scottish border in Northumberland. So who was she? And what’s the story behind this little known example, close to the ruinous Iron Age village east of Dumyat? The truth is, we don’t know for sure as yet. Tales are told of a local lady called ‘Katie’ at the wells near Abernethy and Kilsyth, each with their own domestic myth—but it seems that a wider mythic status underlies this dedication. One very fine notion comes from the pen of Pictish researcher Ronald Henderson (2008; 2014), who tells that the name derives from a corruption of both St. Katherine of Alexandria [Katie] and the Pictish King, Drust or Drustan [Thirsty]. The latter etymological postulation finds faith in the fact that the great crags of Dumyat less than a mile to the east is universally credited with being the last Pictish stronghold at the old hillfort there. 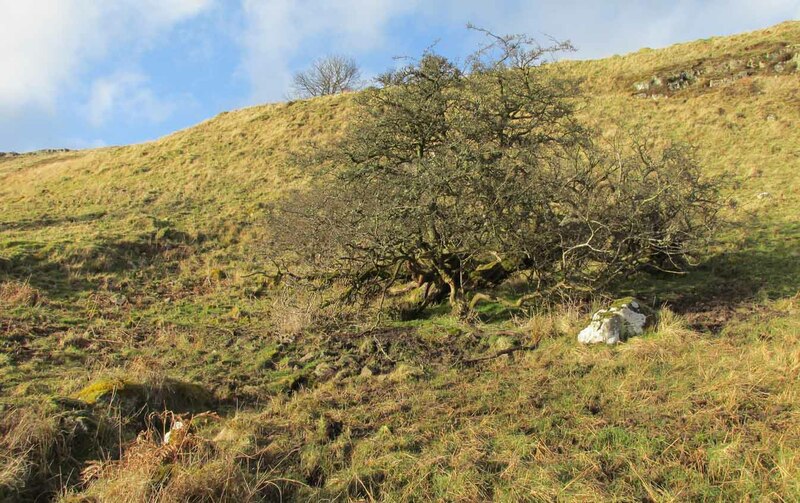 …This well on the hills north of Logie village—with its old hawthorn for companion above the old path to medieval Fossachie village—flows nicely, and its freezing waters are very good to drink. 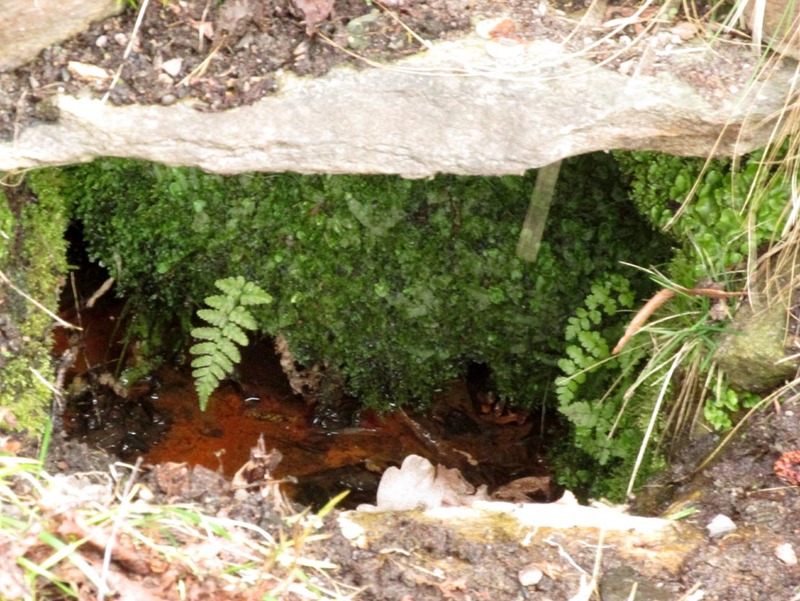 Twenty yards east of the boggy overflow are the overgrown remains of an isolated Iron Age ‘homestead’ or hut circle, and the waters of Katie Thirsty’s Well would have been the primary drinking supply to the people living there in ancient times. It’s a beautiful spot to visit, with lovely views for many miles to the east, south and west. 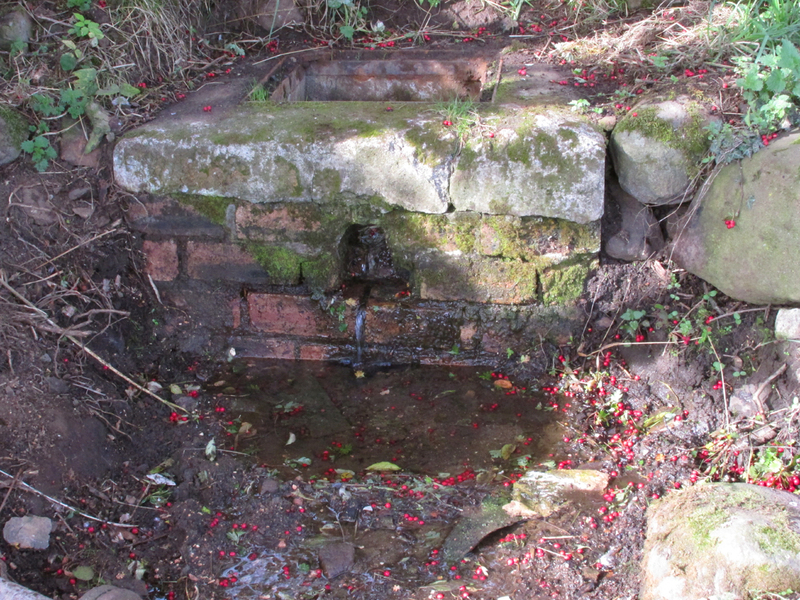 If you’re going to visit the Fairy or Highlandman’s Well nearby, take time to visit Katie Thirsty’s refreshing flow too. As for Katie herself: does anyone have their own ideas about her…? Henderson, Ronald W., Rex Pictorum – The History of the Kings of the Picts, Perth 2008. Henderson, Ronald W., “Drust… of the Hundred Battles,” in Celtic Guide, 3:4, April 2014. Morris, David B., “Causewayhead a Hundred Years Ago,” in Stirling Natural History & Archaeological Society Transactions, 1935. 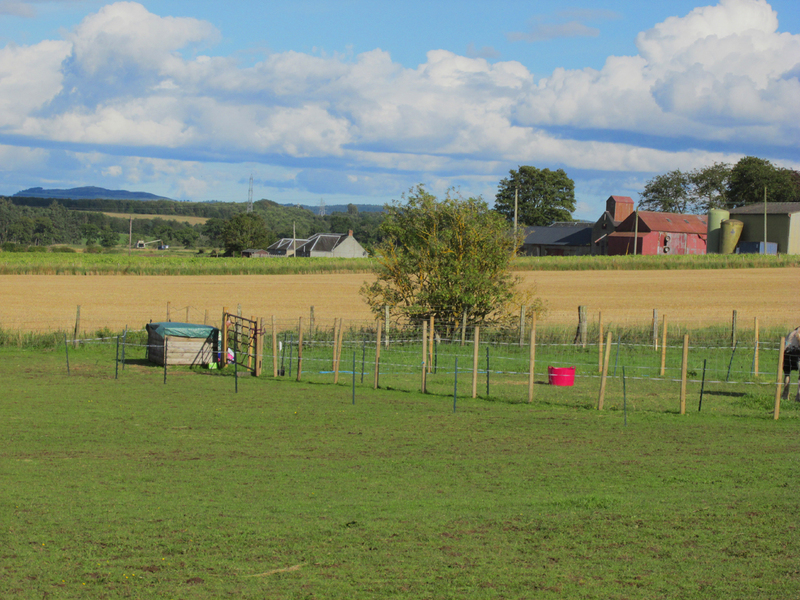 Just less than a mile east of Blairgowrie, the site is situated about 200 yards along a farm track that runs north from the A926 Rattray – Alyth Road. This road is narrow with a lot of bends and very busy, with no safe parking places. 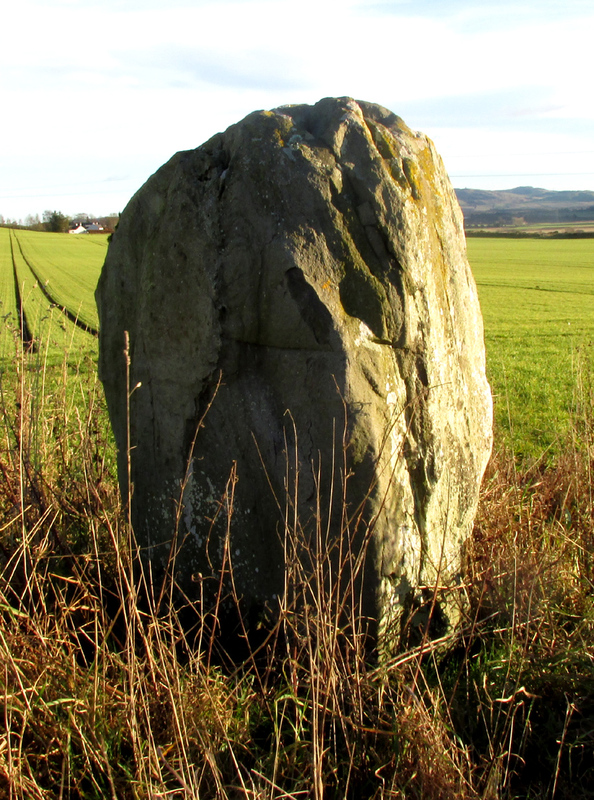 It is best to walk from Rattray, the stone will be seen in the field just east of Drumend Farm. 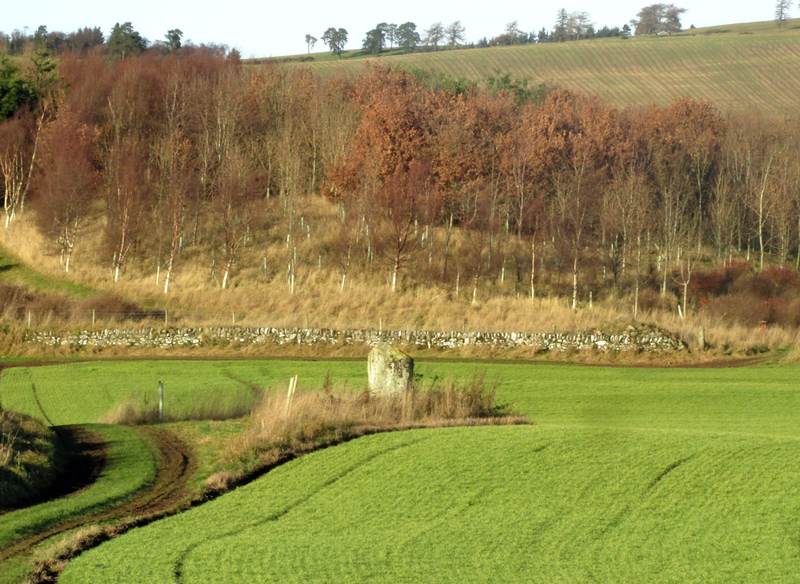 “Standing Stone on the Farm of Standing Stone, Old Rattray. 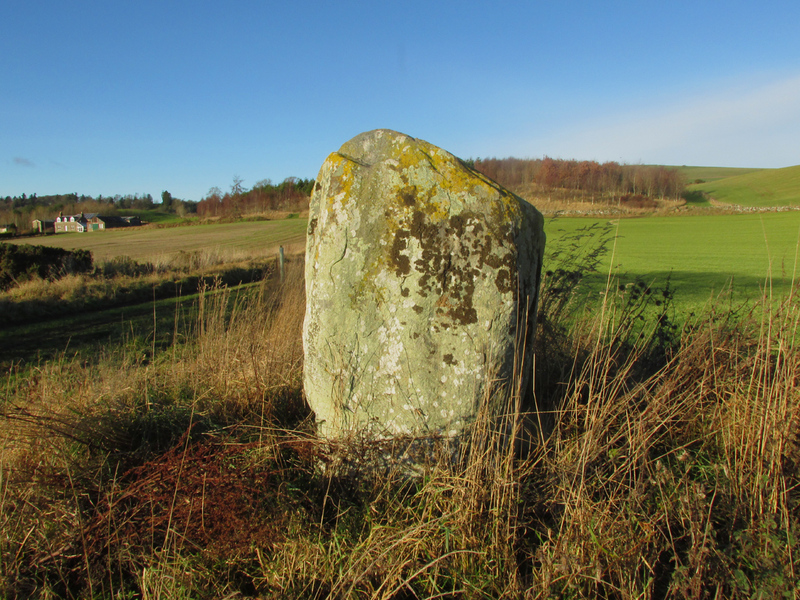 [A] monolith attracts our notice, in a field on the north of the main road, one mile and a quarter east of the middle of Old Rattray village. The height above sea-level is 270 feet. This monolith …[has a] mineralogical composition …more analogous to the quartziferous schists so frequently found in the vicinity. The top is smooth, with an inclination towards the south-east, and the whole mass is squarish and pillar-like. It is set up with the longer axis N.E. 50° and S.W. 50°. The highest point is 5 feet 1 inch above ground, the basal girth 8 feet, but rather more than mid-way up it increases to 10 feet 4 inches. This brave survivor has a commanding position over the valley of the River Ericht, and again we can only lament the loss of its companions, but be thankful it too didn’t fall prey to ‘agricultural improvements’ or religious bigotry. Herdman, Rev. 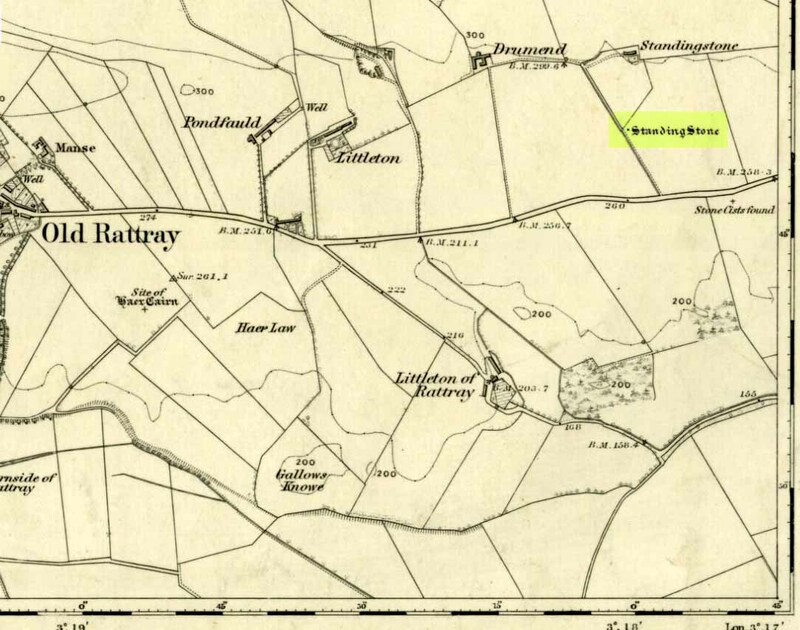 William, New Statistical Account, Perthshire, Parish of Rattray, 1845. 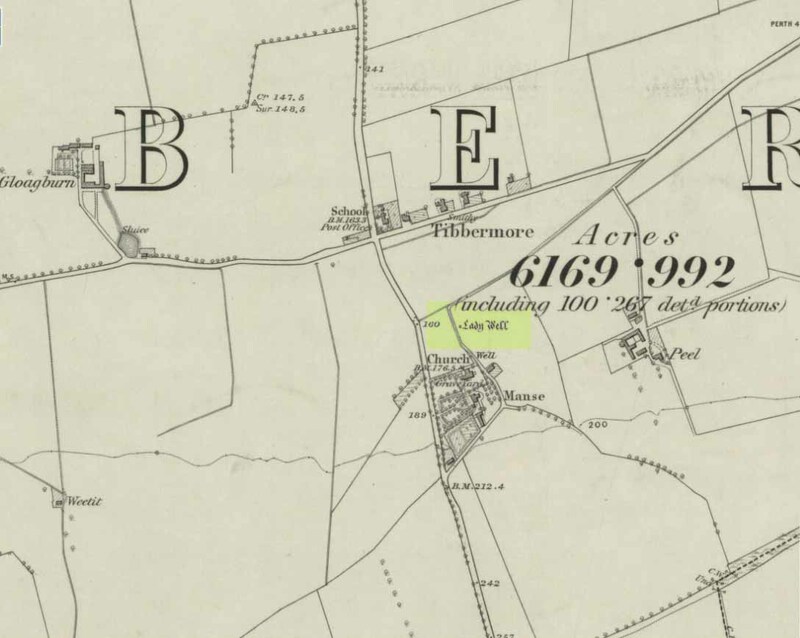 Coles F.R., ‘Report on stone circles surveyed in Perthshire (South-East District), with measured plans and drawings; obtained under the Gunning Fellowship’, Proc. Soc. Antiq. Scot., vol. 43, 1908-9. 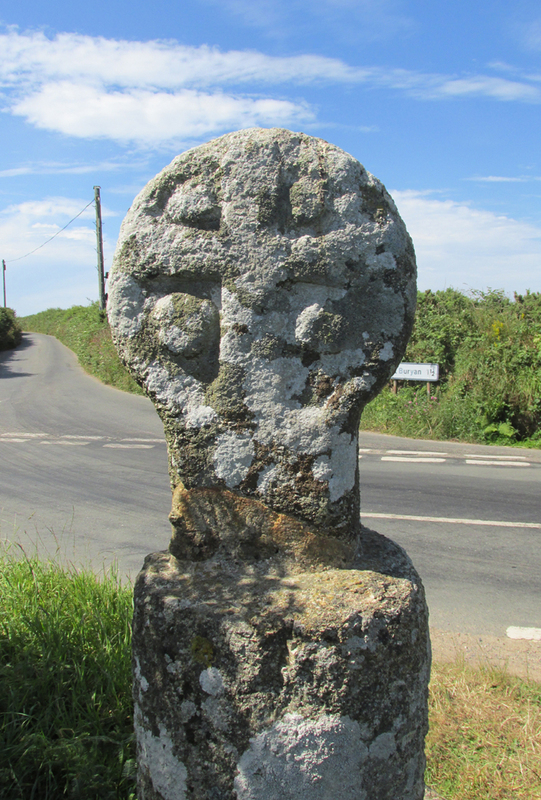 Travelling along the B3315 from Penzance to Lands End, the Cross is on the south side of the road at the junction with the minor road to St Buryan, past the Merry Maidens circle. 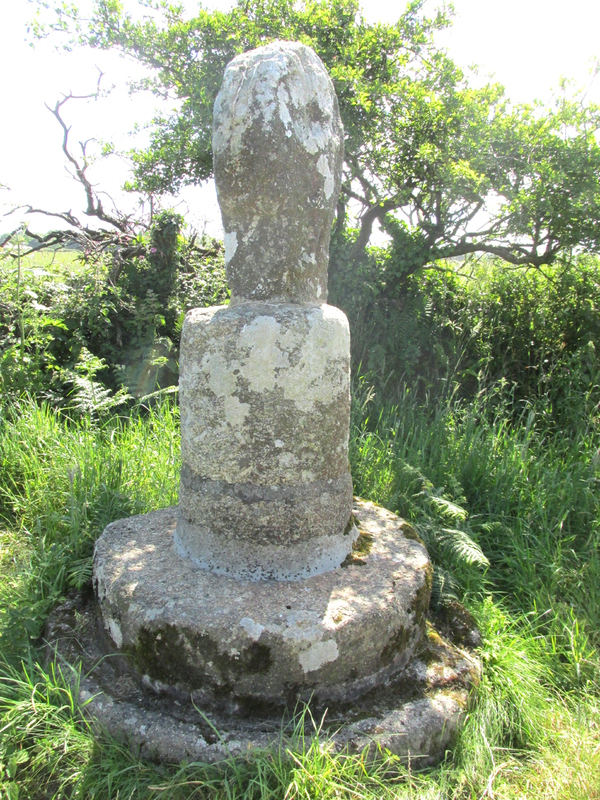 The Cross is assumed to have been carved perhaps a century after the cross in St Buryan churchyard. 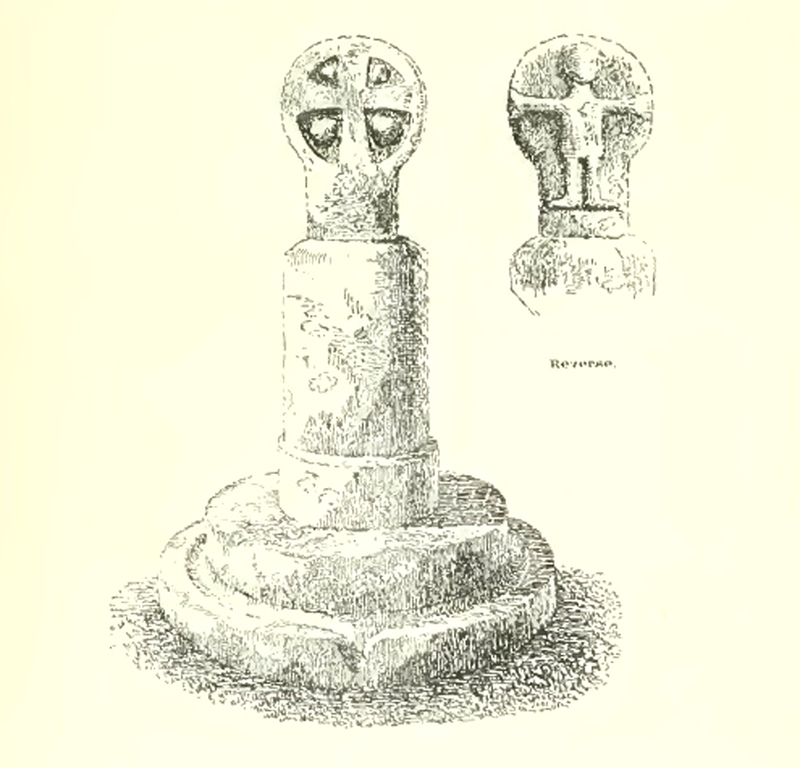 Its upright figure of the crucified Jesus, forward facing, wearing a knee length tunic, and with feet out at right angles is stylistically similar to the churchyard cross, which probably dated from the time of Athelstan’s charter, and which Ann Preston-Jones and Andrew Langdon state is very similar in style to crucifixions on crosses in the north of England for which a 10th or early 11th century date has been suggested. During the mediaeval period St Buryan church was noted for its privileged sanctuary which extended beyond the church and churchyard, which privilege may have been granted by the charter of King Athelstan (924-939). 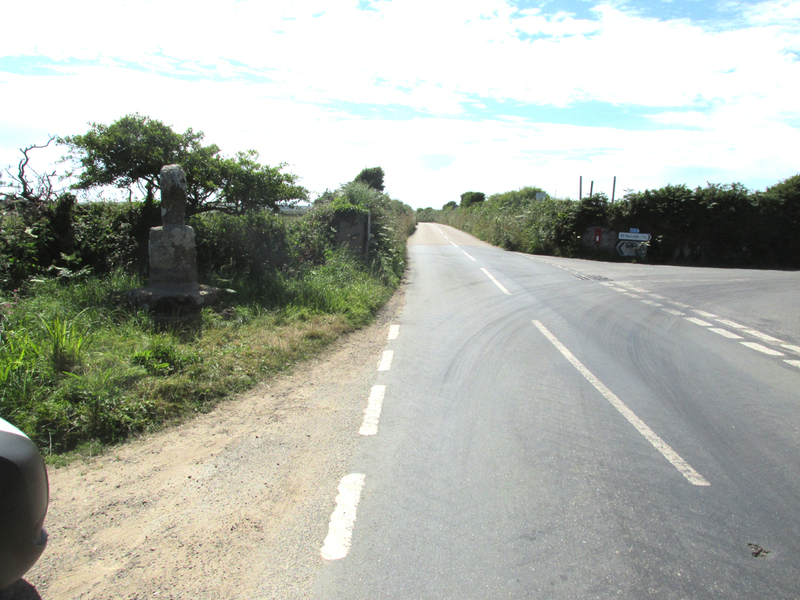 Preston-Jones and Langdon (Andrew) consider that the Boskenna Cross, as well as having been a roadside way marker, may, with others ‘perhaps once have marked the sanctuary’s limits‘. 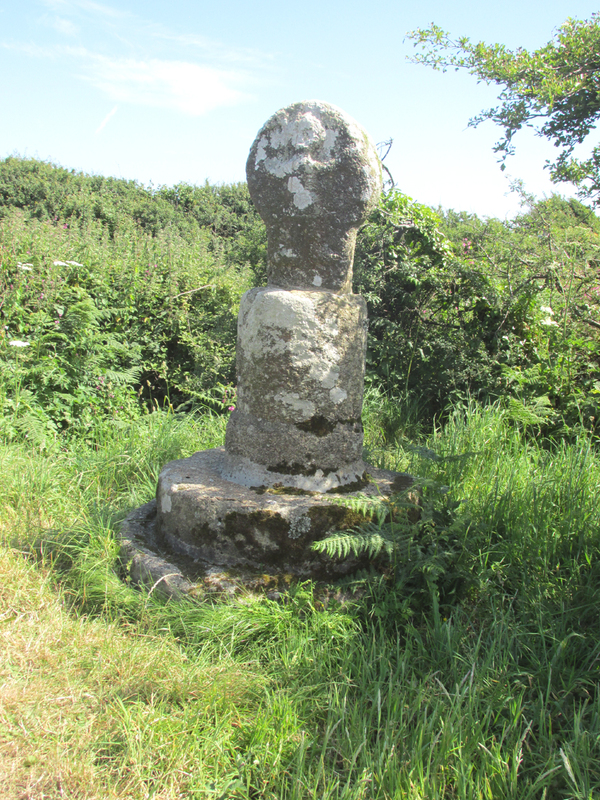 ‘The only ancient part of the monument is the little cross at the top, which is mounted on a base made up of an extraordinary collection of apparently disused circular granite stones. Immediately beneath the cross is a cylindrical piece, the upper edge of which is roughly rounded off. Beneath this comes a short drum, about two inches wider than the piece above and nine inches deep. The next two stones are much wider but not so deep as the last, the bottom one consisting of the lower portion of an old cider-press, with its surrounding channel and lip ! There is a good deal to admire in the feeling which prompted this effort to once and for all preserve so ancient a relic, and the care bestowed in the erection of this curious substructure goes far to remove its incongruity. Front — The figure of our Lord here sculptured is quite the best example in which He is represented wearing the tunic; the expanded sleeves are especially apparent, as well as the outline of the garment above the knees. The feet are very large, and turn outwards at right angles. Back — On the head is a cross with expanded limbs, flush with the surface of the stone. The four triangular sinkings, or recesses, which form the background are not of uniform size, the lower being considerably larger than those above, thus making the lower limb the longest. The inner portion of each sinking is raised, forming bosses in low relief. Side view from the east. The report on the restoration notes that the pedestal was hit by a vehicle on 27th February, and it was likely the impact caused the Cross head to fall off. The Cross was restored during June and July 2002, when the opportunity was taken to move the pedestal away from the road, 2m south east of its former position. Langdon, Arthur G., Old Cornish Crosses, Truro, Joseph Pollard, 1896. Langdon, Andrew, Stone Crosses in West Penwith, The Federation of Old Cornwall Societies, 1997. Preston-Jones, Ann & Langdon, Andrew, St Buryan Crosses, Cornish Archaeology, No 36, 1997. Approaching Tibbermore from Huntingtower, turn left in the village and the site of the Lady Well is visible in fields on the left, just to the north of a bush growing on the north-south boundary fence on the east side of the roadside paddock before you get to the church. On the day of my site visit I wasn’t able to get close to the site, owing to the subdivision of the roadside paddock by wire fences and the presence of horses. Growing crops barred access from the east. 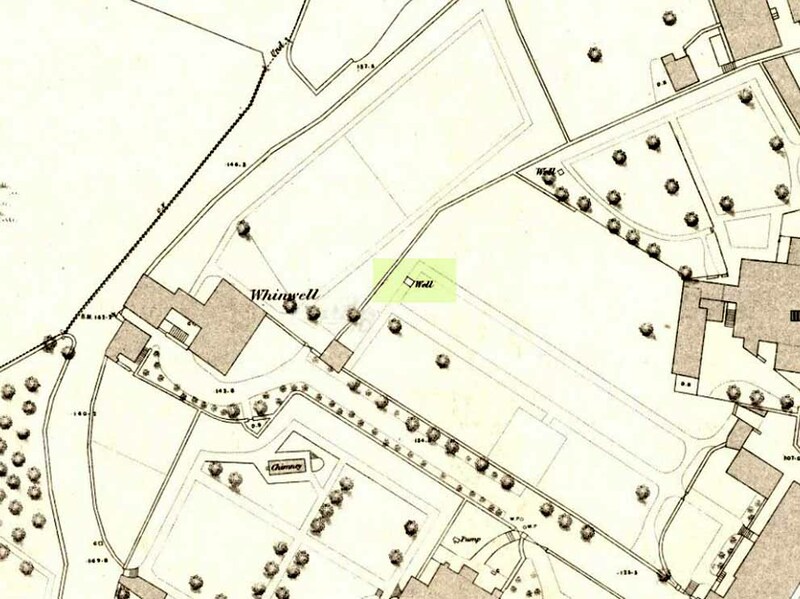 But it appears that all physical traces of the well have been destroyed, and the actual site of the well as shown on old OS maps now shows no evidence of it, but a large bush a few yards south may indicate the present site of any vestigial spring. Hew Scott, in Fasti Ecclesiae Scoticanae wrote that the church at Tibbermore was dedicated to St Mary, and that there was a Well of St Mary. Tibbermore was a mensal parish of the Bishop of Dunkeld – i.e., its parish revenues etc, were accrued to the Bishop, who maintained a residence in the parish prior to the Reformation. Pennant wrote in 1772 that the church of Tibbir-moor took its name from a holy well dedicated to the Virgin Mary. John Inglis in the Old Statistical Account wrote that the name Tibbermore was understood to be compounded of two Gaelic words, tuber and more, which signify a large well—referring probably to a plentiful spring of water immediately adjoining to the church-yard. veneration and pilgrimage? 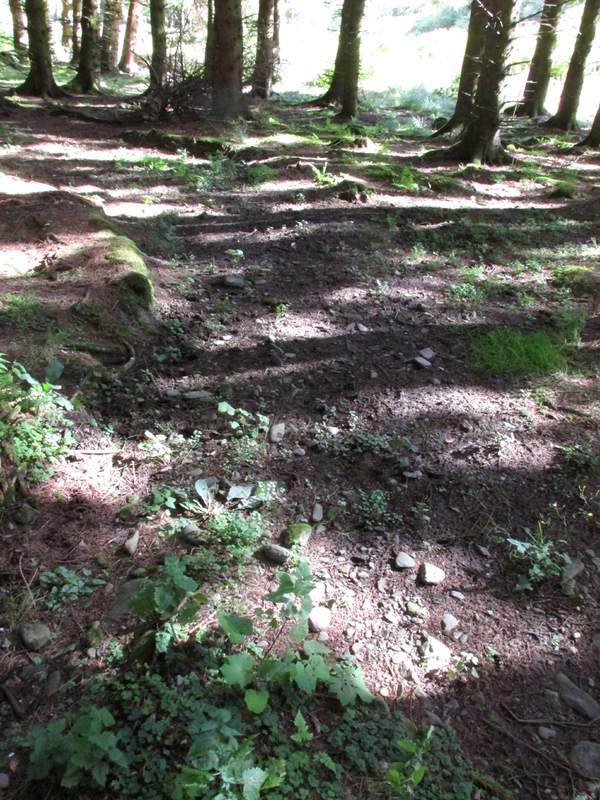 Adding to this speculation is the presence of several cup marked stones within a mile or so of the holy well, which may possibly indicate a very ancient sacred landscape. Pennant, Thomas, A Tour In Scotland 1772, London, Benjamin White, 1776. Inglis, John, Old Statistical Account for Tibbermore, Perthshire, 1791-99. Scott, Hew, Fasti Ecclesiae Scoticanae, Vol. IV, Edinburgh, Oliver & Boyd, 1923. Watson, W.J., The Celtic Place-Names Of Scotland, Revised Edition, Edinburgh, Birlinn, 2004. (originally published 1926). Travelling north through Balkeerie on the Newtyle/Glamis road, turn right onto the Denoon road and follow it to the T-junction. 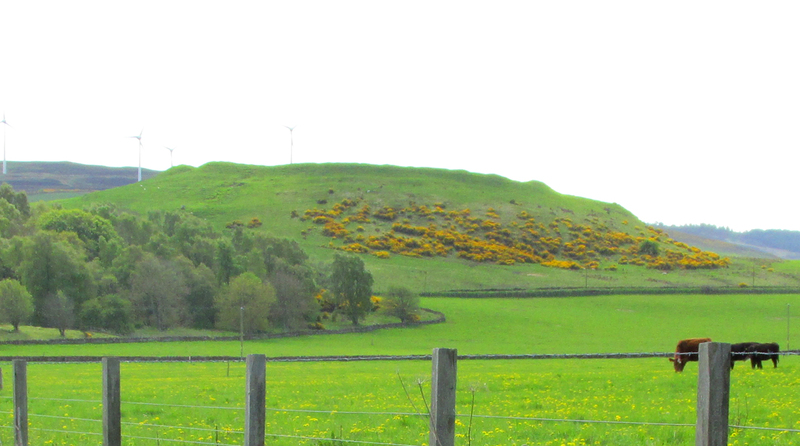 Turn right and, a few hundred yards on to your left, the large hillfort of Denoon Law rises up to your left. You can’t really miss it! Denoon Law is an impressively lush and green hill fort hidden away in the Sidlaw Hills, in the Denoon Glen, parallel to the Vale of Strathmore. It can be entered froma gap in the ramparts on the north side. Be careful of the precipitous drop from the south east side! 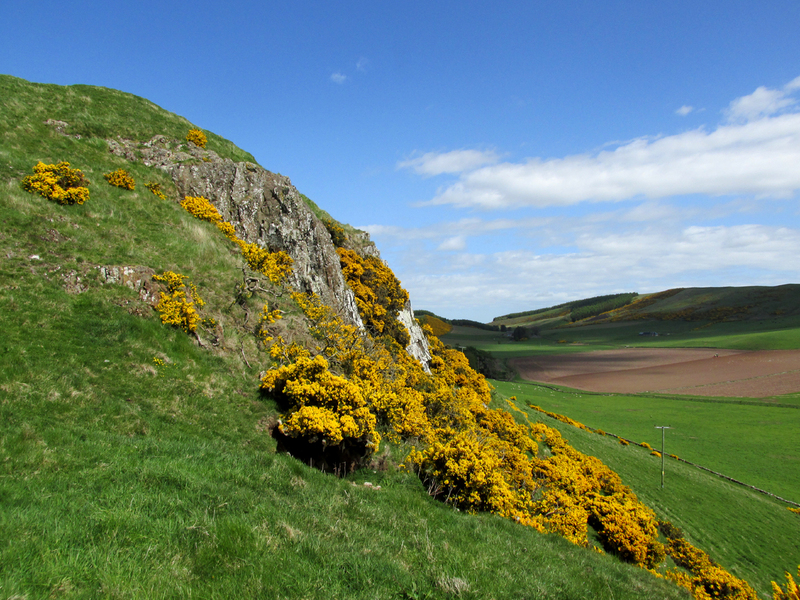 ‘This fort crowns the summit of Denoon Law, a steep-sided volcanic plug on the NW side of Denoon Glen, a narrow valley at the N end of the Sidlaw Hills. 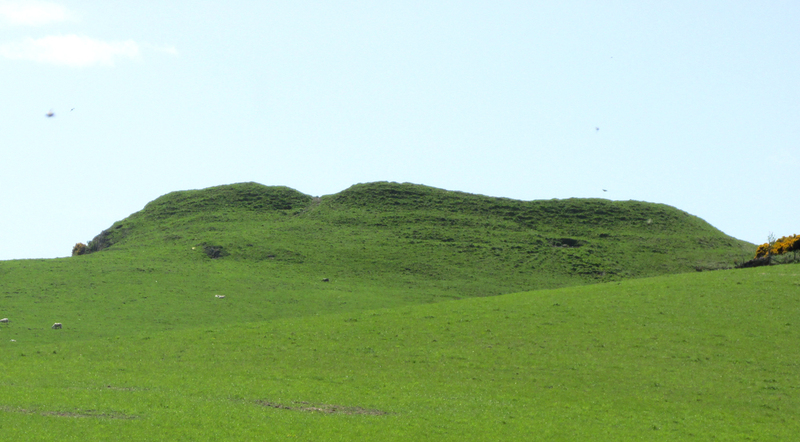 The fort is roughly D-shaped on plan with the chord of the D formed by a long straight rampart that stands above the precipitous SE flank of the hill. It measures 105m from NE to SW by 55m transversely within a rampart that measures up to 17m in thickness and over 5m in external height but is clearly of more than one phase. Where the differentiation is clear, the latest phase of rampart measures about 6m in thickness and overlies the remains of a much thicker earlier rampart. 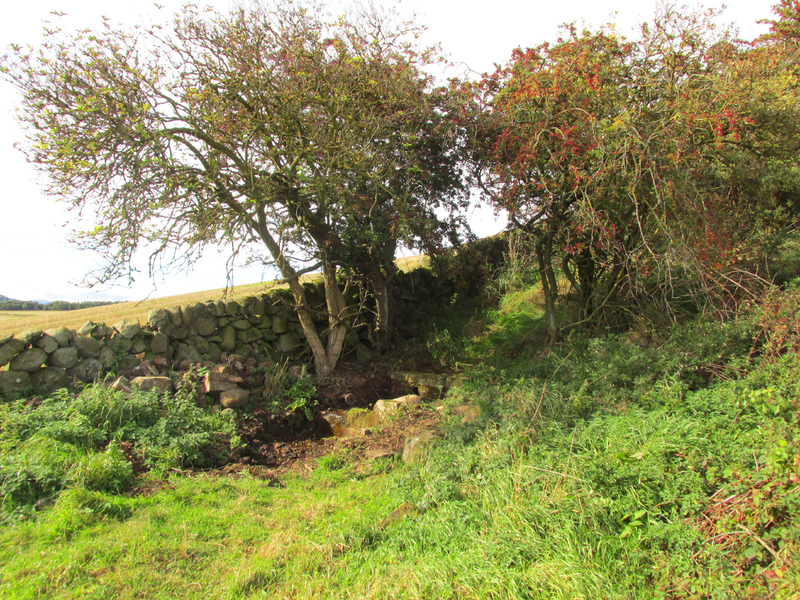 Intermittently visible at the SW end of the fort is an outer face to the later rampart, comprising drystone walling that has, in places, been displaced downslope by the weight of core material behind. This outer face comprises no more than four or five courses of thin sandstone slabs and, although what is currently visible will only be the top of the surviving wall-face, a wall constructed of such material cannot have stoodto any great height and what we see today is likely to be the remains of some form of comparatively low revetment. In both the earlier and later ramparts there is very little evidence of stone within the core and it appears that the material (boulder clay) for both has largely been derived from several large quarries within the interior of the fort. At the SW corner of the fort most of the rampart has been removed, leaving only the lower part of the outer talus. The fort, or at least its latest phase, had two entrances, one on the NE and another on the NW, both of which are crossed by the remains of a narrow, later, wall that runs around the entire circuit of the fort and may be associated with at least some of the buildings within the interior. Outwith the main rampart there is a series of three outer ramparts, again with very little evidence for the use of stone in their construction, which run from the edge of the very steep slope at the NE end of the fort, around the N side to the entrance on the NW. All three lines of defence have been reduced to little more than terraces, though there is no evidence for them ever having been cultivated. At the entrance on the NW, the terminals of these ramparts (on both sides of the entrance) are obscured below outwash deposits from the slope above. To the SW of the entrance it is not at all clear what the relationship is between the defences of the fort and the enclosure that occupies the rocky and extremely uneven SW flank of the hill. 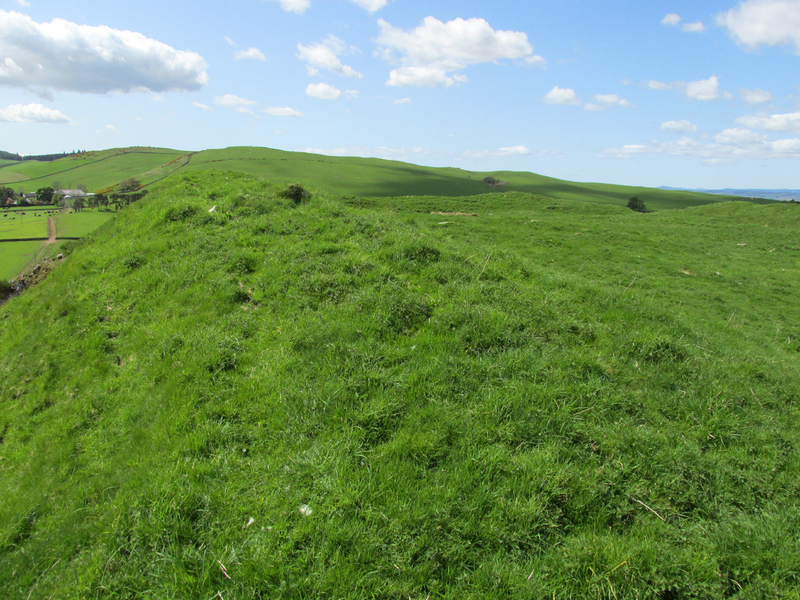 This enclosure, which has an entrance on the W, could be some form of annexe or it could represent the SW end of an enclosure that once took in both this area and the rest of the summit. 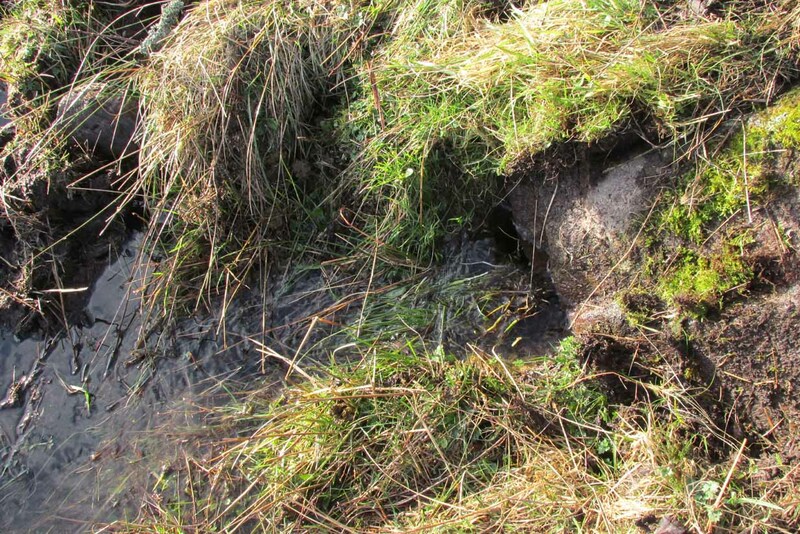 The streamlet is the Ewnie Burn flowing south-east of the Law. ‘early time, weird-like, a legend’s muffled chime ‘. ‘The Hill of Denoon was at that remote period accounted sacred or haunted ground. It was the mythical abode of the elfins and fairies, and formerly a fitting haunt for their midnight revelries. When the silvery moonbeams lovingly slept in dreamy beauty on the green slopes of the enchanted Hill, and the blue bells and the purple heather were wet with the dew of angels’ tears, arrayed in gossamer robes of bespangled gold, with wands of dazzling sheen and lances of magical bright-ness, would the troops of elfins flauntingly dance to the music of the zephyrs, until the shrill cry of the chanticleer put an end for the time to their mystical enchantments. Suddenly, as in blue clouds of vapour, they noiselessly vanished away, no sound remaining to break the oppressive stillness, save that of the mountain rivulet, as it fretfully leapt from crag to crag, as if piteously regretting the mysterious departure of its ethereal visitors. Having forsworn the presence and companionship of the terrestrial inhabitants of earth, it was a sacred dictum in the code of the fairies that no habitation for human beings should be permitted to be built within the hallowed precincts of the enchanted ground. Unable of themselves to guard against such sacrilegious encroachment, they had recourse to the aid of, and formed a secret compact with the demons, or evil spirits, whose sole avocation consisted in doing mischief, and bringing trouble and misfortune on those under the ban of their displeasure. By this compact these evil spirits became solemnly bound to prevent any human habitation whatever from being erected on the hill, and to blast in the bud any attempts whensoever and by whomsoever made to break this implacable, unalterable decree. It was about this time the alarm-note was sounded, as the Queen of the Fairies, who, with an eye more observant than the rest of her compeers, observed one evening in the moon-light, certain indications of the commencement of a human habitation. Horror and dismay were instantly pictured on the fair countenances of the masquerading troops of merry dancers as the awful truth was ominously revealed to them by the recent workmanship of human hands. A council of war was immediately held, when it was determined to summon at once the guardian spirits to their aid and protection. These demons instantly obeyed the haughty summons, and, in the presence of those they had sworn to protect, they in a twinkling demolished the structure, hurling the well-proportioned foundations over the steep rock into the vale beneath ! The builder, doubtless very much surprised and chagrined when he returned to his work in the early dawn of the following morning, was sorely puzzled to account for the entire disappearance of the solid foundations of the great castle he intended to be erected on the Hill. He did not, however, waste much time, or use much philosophic argument, on the matter, and gave orders to prepare new foundation of even a more durable character. The demons, to show their invincible power, and for the sake of more effect, allowed the new foundations to rise a degree higher than the former, before they gave out their fiat of destruction. In an instant, however, they were again demolished, and the builder this time gravely assigning some fatal shock of Nature as the cause of the catastrophe quietly resolved to repair the damage by instantly preparing new and still more solid foundations. Additional and more highly skilled workmen were engaged, and everything for a time went favourably on, the walls of the castle rising grandly to view in all the solidity and beauty of the favourite architecture of the period. Biding their time, the demons again ruthlessly swept away as with a whirlwind every vestige of the spacious halls, razing the solid massy foundations so effectually that not one stone was left upon another ! Things were now assuming a rather serious aspect for the poor builder, who, thinking that he had at last hit upon the true cause of these successive disasters, attributed his misfortunes to the influence of evil spirits. A man of courage and a match, as he imagined, for all the evil spirits of Pandemonium, supposing they were let loose at once against him by the Prince of Darkness, he unhesitatingly resolved to keep watch and ward on the following night, and to defy all the hosts of hell to prevent him rebuilding the projected edifice. The night expected came ; but, alas, alas ! “Build not on this enchanted ground ! So, if you are planning to visit Denoon Law – remember: RESPECT THE FAERIES! Guthrie, James Cargill, The Vale of Strathmore: Its Scenes And Legends, Edinburgh, William Patterson, 1875. Royal Commission on the Ancient and Historical Monuments of Scotland. 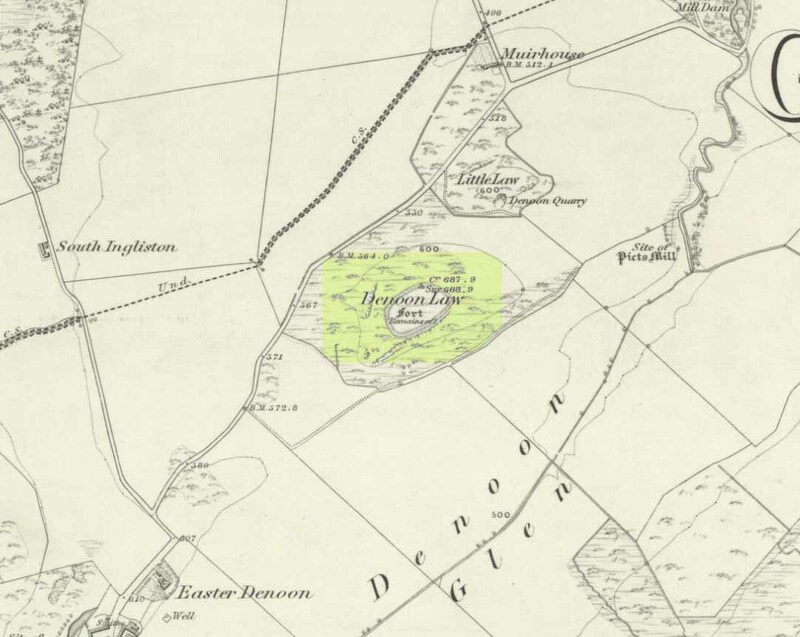 The archaeological sites and monuments of Central Angus, Angus District, Tayside Region, The archaeological sites and monuments of Scotland series no 18. Edinburgh, 1983. 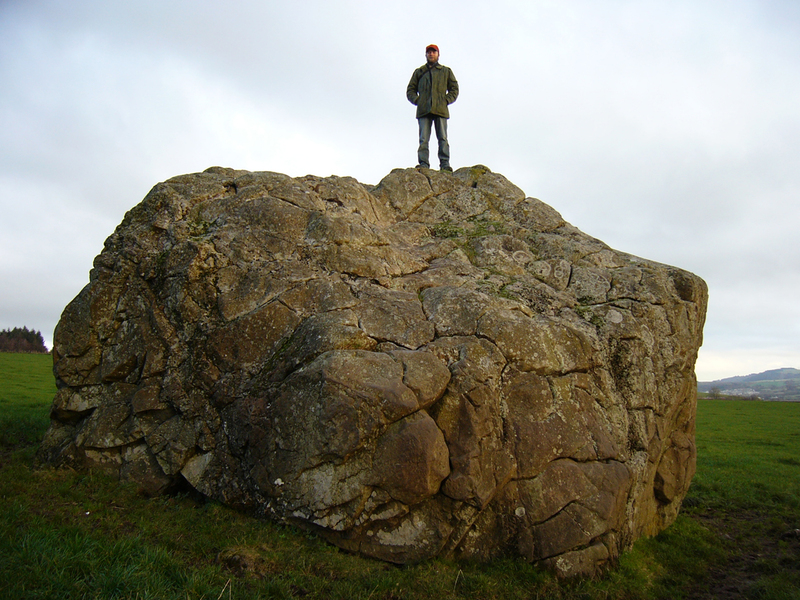 Dorward, David, The Sidlaw Hills, Forfar, The Pinkfoot Press, 2004. Note the position of the Well vis-a-vis the wall and the burn. 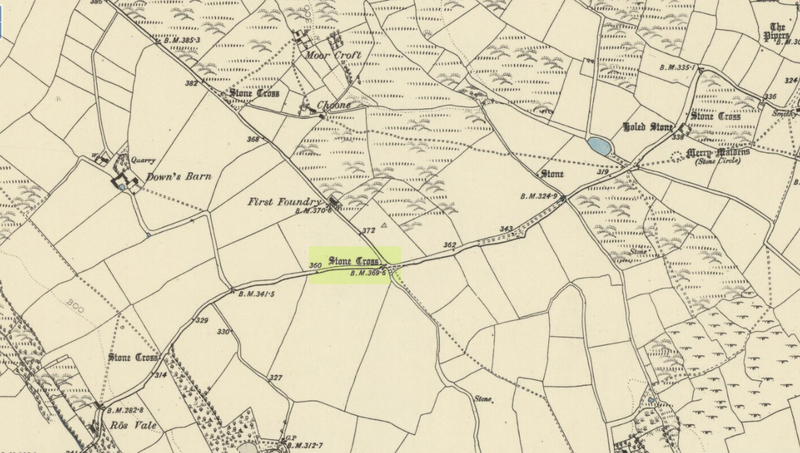 I accessed the site by parking up at Little Tullybelton, walking up the hill and crossing into the field on the left just north of the wood, then walking due west (crossing barbed wire fences) until dropping down into the valley of the Ordie Burn and following the track into the wood, then, noting where the burn crosses south of the old stone wall. 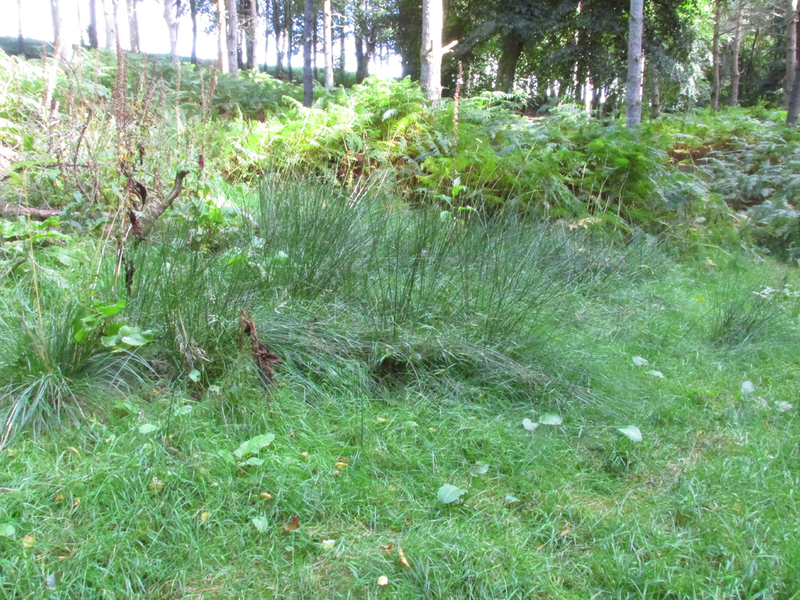 The site of the well is marked by some tussocks of cotton grass. Don’t confuse with a patch of nettles and docks 2-300 hundred yards east where you enter the wood. All that remains is a clump of Cotton Grass. 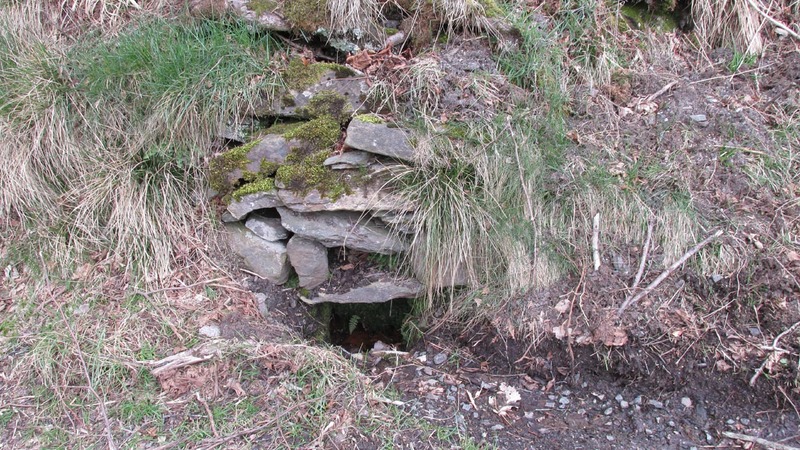 This well was destroyed about 170 years ago and the site of it is quite hard to find as the land has been turned over to forestry. It was near a chapel and burial ground that were also destroyed by the farmer of the time. 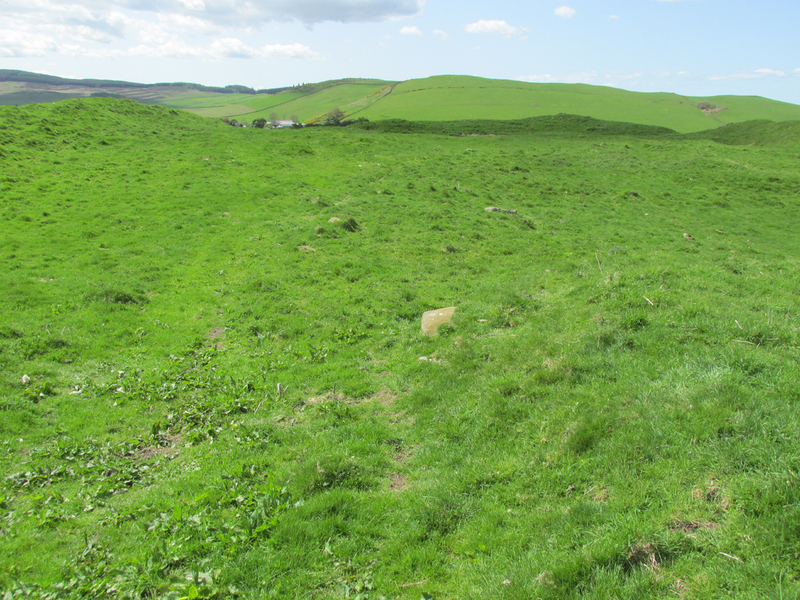 The old wall formed part of the boundary of the detached portion or enclave of the neighbouring parish of Methven. ‘Superstition formerly invested St Bryde’s, and Chapel Well, and perhaps some others, with a sacred character, and made then places of resort for pious purposes. ‘The site of a Holy Well which has been traditionally associated with the adjacent chapel. 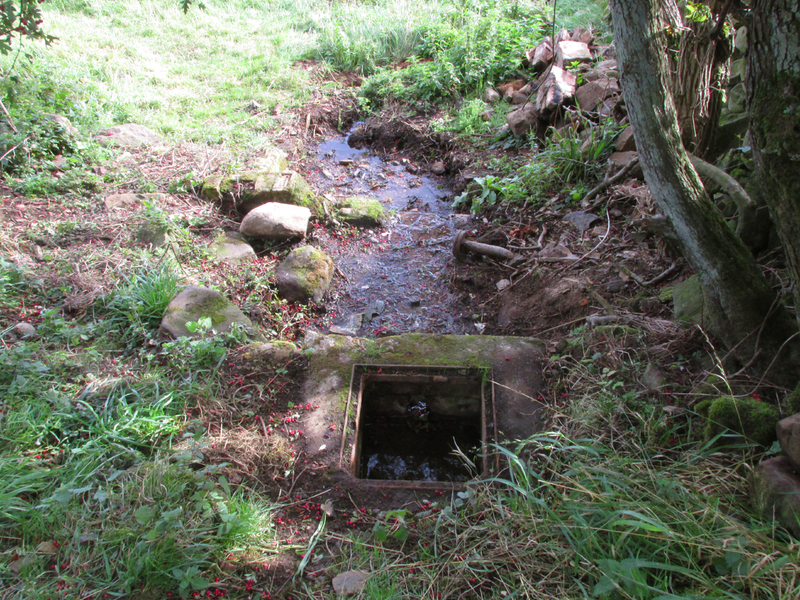 The water of this well is now carried by a covered drain into the adjacent stream, and the well filled in‘. 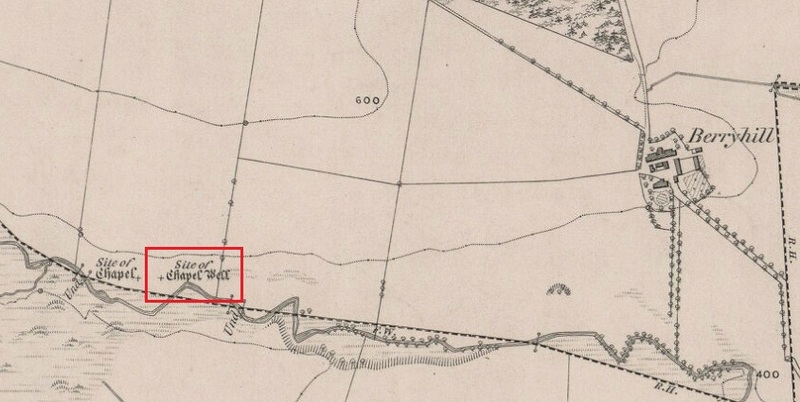 ‘The site of an ancient chapel on the north bank of the Ordie Burn, the chapel was demolished and the graveyard rooted up some years ago by the present tenant of the farm, who has pointed out the site, the dedicatory name is not known‘. 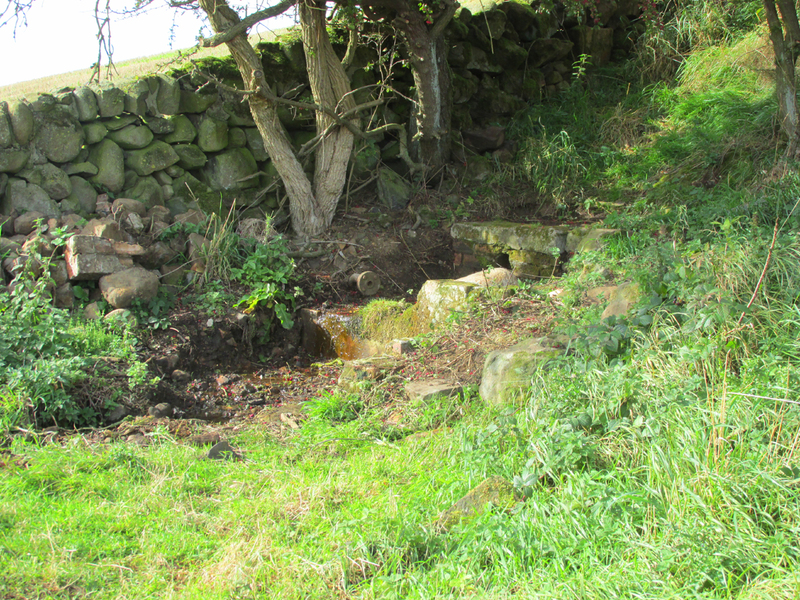 I could find no evidence of the culvert which discharges the waters of the Well into the Burn. What does seem to have been missed is the survival of part of the ancient sunken roadway or pilgrim path to the site, which is still clearly visible. The fact that it was visited by locals on the first Sabbath in May would point to it having originally been a Beltane well, and therefore of pre-Christian origin. In Kinglassie village, from the Main Street follow Redwells Road and turn right where it forks and follow the track until you get to the derelict ground; then turn left up the slope, following the eastern (right hand) edge of the wall up to the well. This spring is now piped into a trough. There are several boulders nearby but no dressed stone and it is doubtful if there was ever any structure here. It is known by both names. I am inclined to discount Cunnynghame’s laboured interpretation in view of Watson’s later linguistic analysis, as well as bearing in mind he was a minister of a Kirk that went out of its way to deny and denigrate the native pre-Reformation saints. Because of its position and ambience despite past industrial despoilation, I am inclined to a saintly attribution to the well, which as in so many cases in Scotland has lost its true history owing to the depredations of the Reformation. 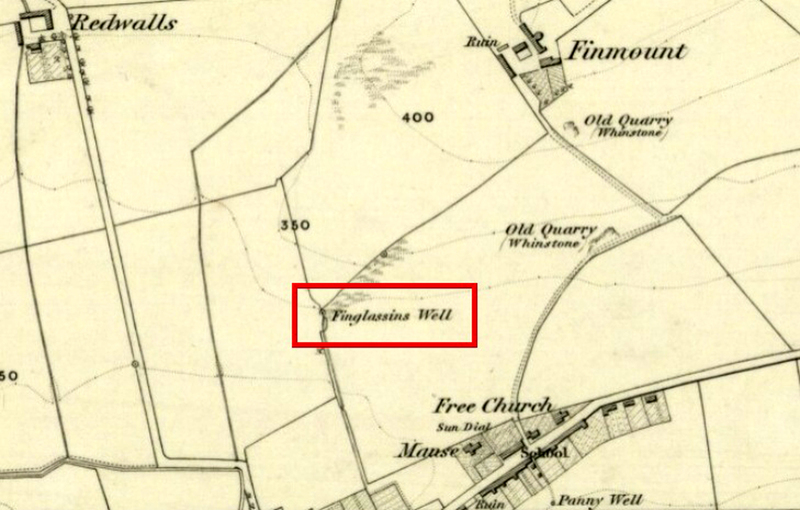 If Watson’s interpretation of ‘Finmont’, ½ mile north-east of the well, is indeed ‘Holy Hill’ then Finglassins Well may have been a part of an ancient, perhaps heathen ritual landscape. Reid, James, Parish of Kinglassie, Old Statistical Account, Fife, 1792. Cunnynghame, J.M. 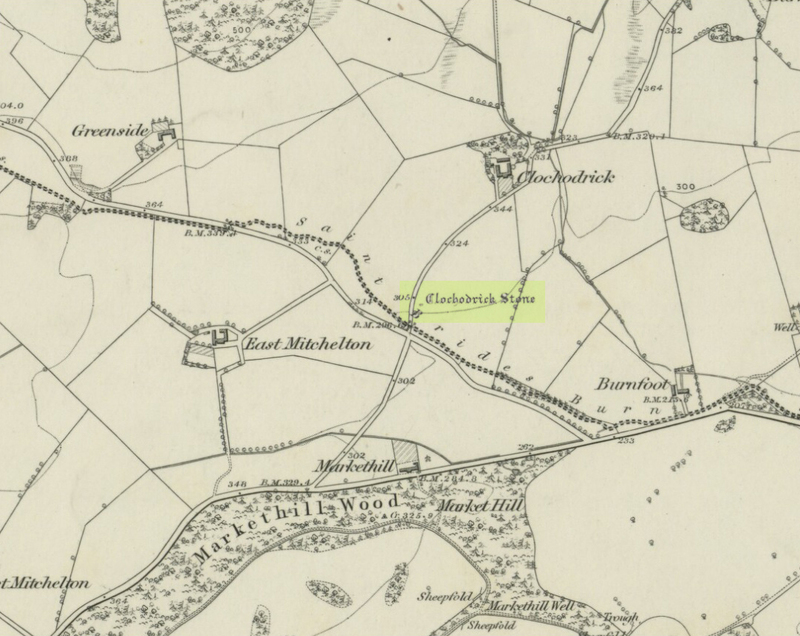 Parish of Kinglassie, New Statistical Account , Fife, 1845. Butler, Alban, The Lives of the Fathers,Martyrs and Other Principal Saints, James Duffy: Dublin 1866. Forbes, Bishop A.P., Kalendars of Scottish Saints, Edmiston & Douglas: Edinburgh 1872. Watson, W.J., The Celtic Place Names of Scotland, (revised edition), Birlinn, Edinburgh, 2004 (originally published 1926).